The Montego pool is one pool model that’s tough as nails and built to handle hard abuse from big families or older teenagers that can play rough. 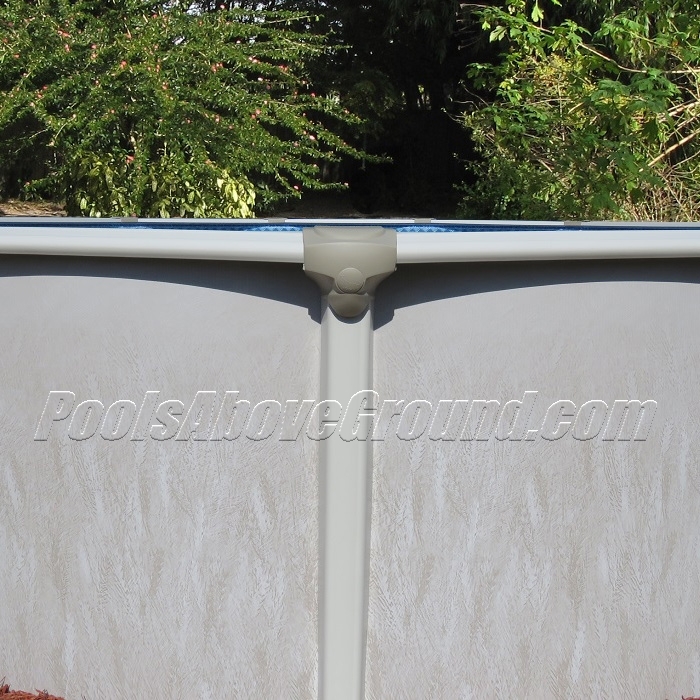 We chose this model as our pick for “Best Value Above Ground Pool” because it’s much beefier frame and wide thick top rails make it a big step up from the common entry level steel pools. Another reason for the accolades on this pool model is price, it’s as budget friendly as it gets, especially for a buttress free pool model. Buttress free means there are no unsightly beams or legs sticking way out on the sides of the pool. 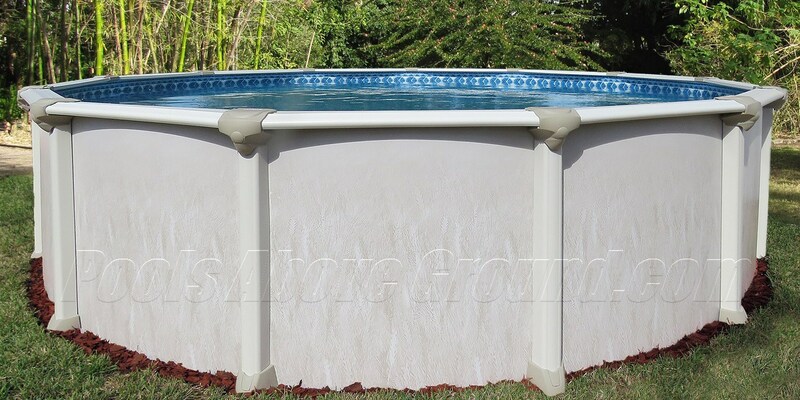 This design is a clean looking smooth sided oval pool that takes up less space width-wise on the ground. This is often a concern for homeowners with narrow spaces to contend with. Montego is not warrantied for use with a salt system, so if this is no concern for you and the all resin saltwater models seem out of reach, Montego is exactly the pool you are looking for. Montego has proven itself to last a very long time too as it has shown to last about 15 years in the tough Florida environment over and over again. 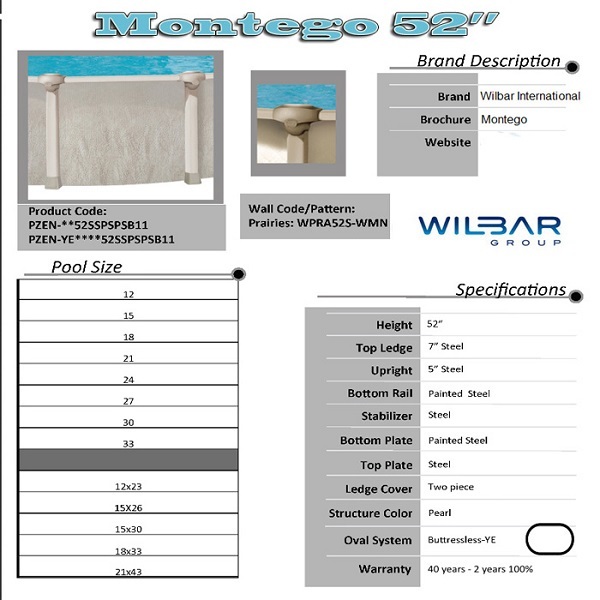 USA- That’s right, Montego is made by Wilbar International in Long Island New York. Wilbar is the largest, one of the oldest and the best above ground pool maker in the United States. This gives meaning to having a true warranty. This ensures finding replacements parts in the future will be possible. Try doing that with pools imported from overseas, not going to happen. 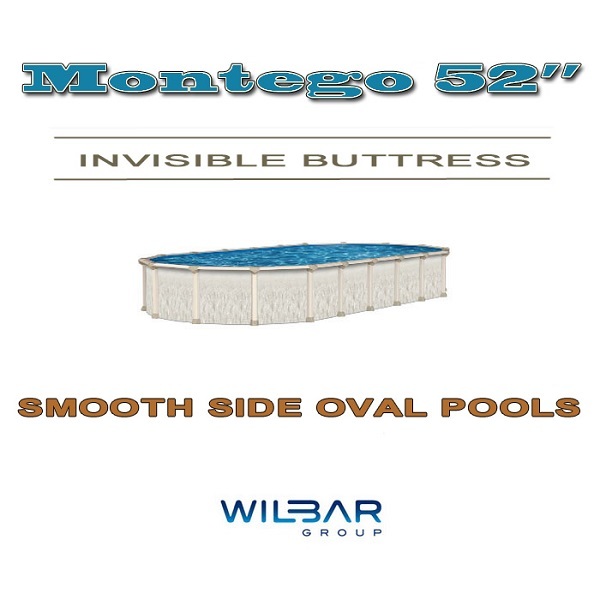 Wilbar pools are made of thicker high grade materials making them much better, stronger and longer lasting. This isn’t always something you can see or feel but it becomes apparent when your imported pool model rusts away in few years. Inferior thinner steel and a lack of protective coatings make for a short life. I have never seen an imported pool older than 8 years. The sad part is the imported pool isn’t any cheaper, so shop smart. 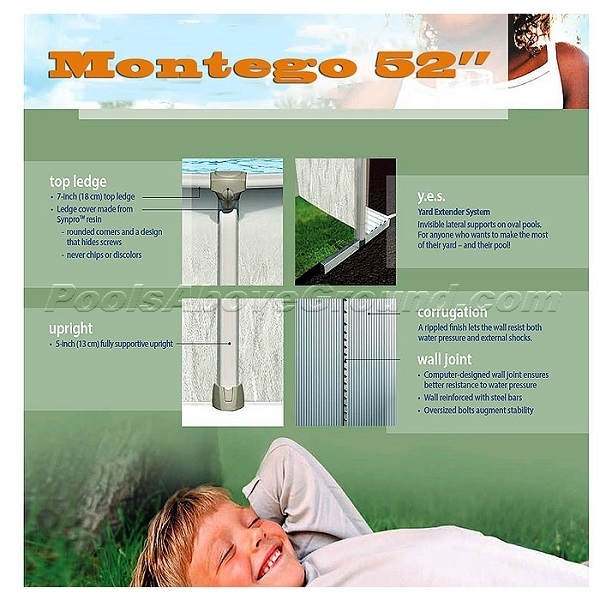 52″ high steel wall with Resin Shield coating for damage and corrosion resistance. Strong 7″ wide solid steel top ledges for durability and longevity. 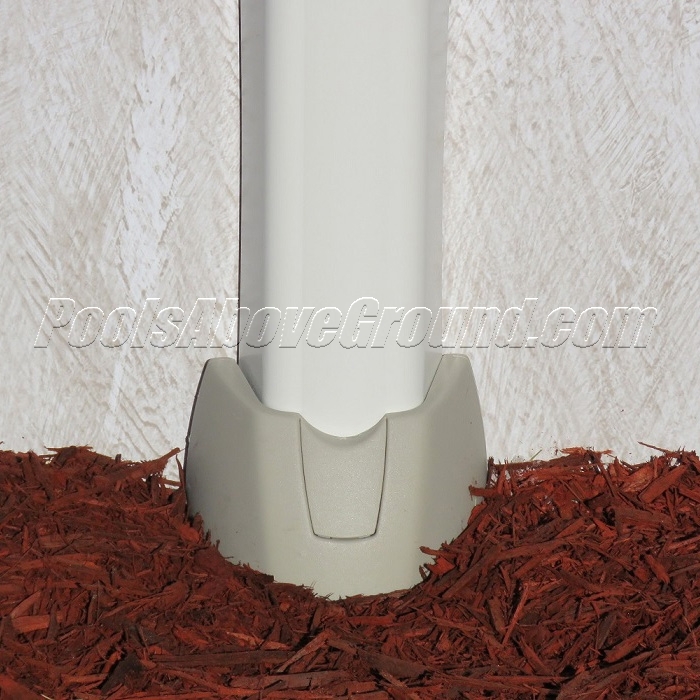 Brawny 5″ wide steel upright posts for additional strength. Resin top caps and foot collars added for style. Includes wide mouth skimmer and return fittings. 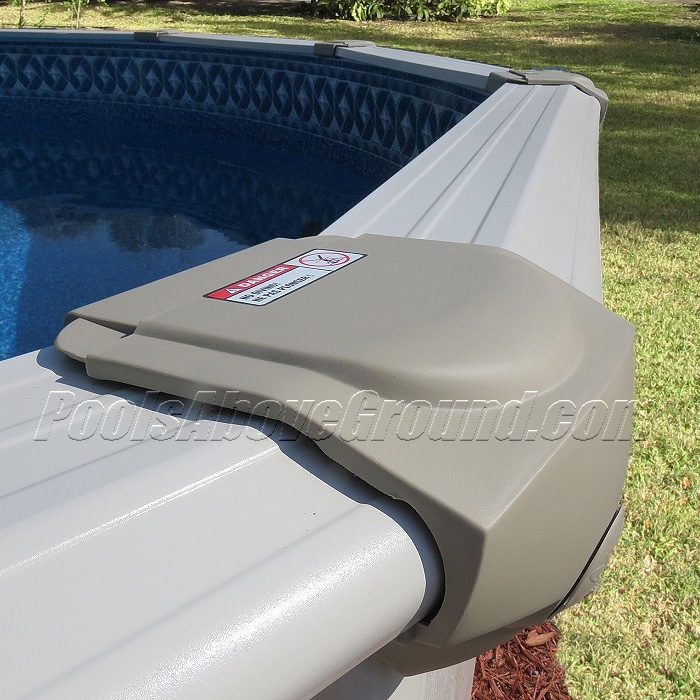 Includes pool liner coping for easy installation.